Sputnik Ossetia publishes photo provided by the witness. 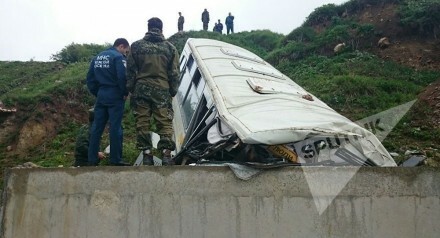 Tbilisi, DFWatch – Six Russian military personnel were killed and further sixteen suffered injuries in a bus accident in South Ossetia, Sputnik Ossetia reported. The accident happened today near the village of Kanchaeti on the road from the republic’s capital of Tskhinvali to Akhalgori (Leningor in Ossetian). According to the report, the bus fell from a cliff on the mountain road following a malfunction of the braking system. All injured were transported to medical facilities in Tskhinvali. The Russian minister of defence, Sergey Shoygu declared that a military aeroplane with medics was sent from Chkalovskiy military airport near Moscow in order to help the injured and take them to hospitals in Moscow.